By: Jason G. Duesing(Eds. ), Thomas White(Eds. & Malcolm B. Yarnell, III(Eds. What is the basis for our denominational distinctives? Are they merely a collection of "faded traditions" or true doctrinal necessities rooted in the Bible alone? Are they theologically rich cornerstones of faith that easily transcend time, culture, and preference? Contributors include Malcolm B Yarnell III ("Upon This Rock I Will Build My Church: A Theological Exposition of Matthew 16:13-20"), Paige Patterson ("Observing the Two Ordinances of Christ"), Thomas and Joy White ("Church Officers and Gender: Can Women Be Pastors? Or Deacons?") and Bart Barber ("A Denomination of Churches: Biblical and Useful") as well as Jason G. Duesing, David Allen, Emir F. Caner, James Leo Garrett, Jr., and Byron McWilliams. • What is the basis for our denominational distinctives? • Are they merely a collection of “faded traditions” or true doctrinal necessities rooted in the Bible alone? • Are they theologically rich cornerstones of faith that easily transcend time, culture, and preference? Contributors include Malcolm B Yarnell III (“Upon This Rock I Will Build My Church: A Theological Exposition of Matthew 16:13-20”), Paige Patterson (“Observing the Two Ordinances of Christ”), Thomas and Joy White (“Church Officers and Gender: Can Women Be Pastors? Or Deacons?”) and Bart Barber (“A Denomination of Churches: Biblical and Useful”) as well as Jason G. Duesing, David Allen, Emir F. Caner, James Leo Garrett, Jr., and Byron McWilliams. 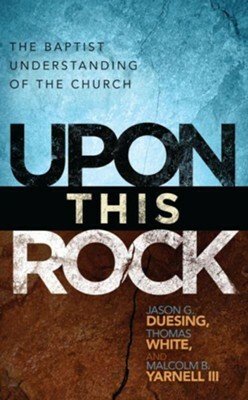 Jason G. Duesing is chief of staff in the Office of the President as well as assistant professor of Historical Theology at Southwestern Baptist Theological Seminary (SWBTS) in Fort Worth, Texas. Thomas White is vice president of student services and communications as well as associate professor of Systematic Theology at SWBTS. Malcolm B. Yarnell III is assistant dean for Theological Studies, director of the Center for Theological Research, director of the Oxford Study Program, and associate professor of Systematic Theology at SWBTS. I'm the author/artist and I want to review Upon This Rock: A Baptist Understanding of the Church - eBook.